Lights … Camera … Wildlife! Want to watch bald eagles incubate eggs in a northwest Georgia nest? How about tuning in for another season of peregrine falcons raising their family on an Atlanta high-rise? From Berry College to around the world, digital cameras and high-definition video streams are offering unique opportunities to watch birds and other wildlife 24/7 in settings usually inaccessible to people. One result has been flocks of fans. 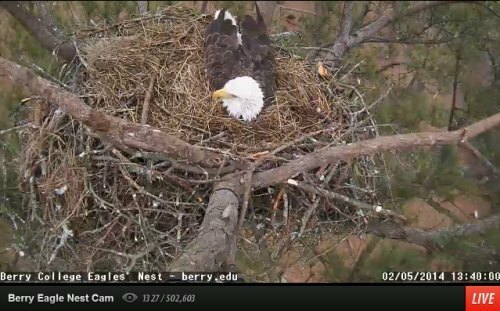 To handle a surge in viewers following publicity about its nest cam and the arrival of eggs, Berry College funneled the video feed through Ustream, a global platform sized to absorb the overload. The camera, which can also be seen on the Georgia DNR Wildlife Resources Division website, is fielding nearly 1,000 viewers at a time and recently topped a half-million views total. When the eggs hatch, expected by mid-February, that popularity will only grow. DNR’s Nongame Conservation Section also recently set up its falcon nest cam outside McKenna Long & Aldridge offices high in Atlanta’s SunTrust Plaza. As soon as the falcons begin nesting – likely later this month – the cam will provide insight into the lives of the world’s fastest birds of prey. In 2013, the first season DNR and project partners live-streamed the falcons, thousands of people watched, including two middle-school classes whose teacher used the stream as an educational tool. Cam managers hope the growing audiences lead to more support for conserving these and other wildlife species. To receive notice when the falcon cam goes live, email rick.lavender@dnr.state.ga.us. Nongame Conservation Section Program Manager Jim Ozier surveyed eagle nests statewide last month, part of the agency’s annual effort to monitor bald eagles in Georgia. Ozier checks by air each January and March to document occupied nesting territories and estimate nest production. Of 171 nesting territories in 2013, 129 were successful, fledging 193 eaglets. The public is encouraged to report eagle nests, by online form or phone, (478) 994-1438. But when your mission is to conserve wildlife and natural habitats that Georgians treasure, capturing a year’s work that runs from the arrival of a disease deadly to bats to another record-setting summer for loggerhead sea turtles is anything but dull. Find out what the Nongame Conservation Section was up to in its just-released fiscal year 2013 report. 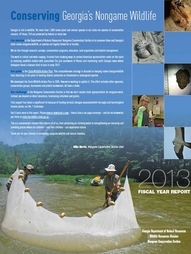 Summary and full versions are posted online at www.georgiawildlife.com/conservation/AnnualReport. Print copies are available at agency offices in Forsyth, Social Circle and Brunswick. Also check out our YouTube video of the fiscal year's highlights. Part of the report explains how the Nongame Conservation Section is supported by grants, fundraisers and direct contributions. The agency does not receive state appropriations for nongame work. Also covered is how downward trends in two key fundraisers – sales and renewals of eagle and hummingbird license plates and contributions to the Georgia Wildlife Conservation Fund state income tax checkoff – threaten efforts to keep native wildlife and habitats common, now and for future generations. Created in 1989, the “Give Wildlife a Chance” checkoff has averaged more than $300,000 a year, benefiting gopher tortoises, cerulean warblers, smooth purple coneflowers and other species. But in 2013, giving slumped to a near all-time low. Help turn this trend around in 2014. The Wildlife Conservation Fund checkoff is line 26 on the state’s long income tax form (Form 500) or 10 of the short form (Form 500EZ). And remember: Every contribution helps! Learn more. Tax forms online. I must admit I don't look forward to winter. During this the harshest time of the year, temperatures plummet, many of the birds of summer have long since departed, the limbs of many of our hardwood trees stand naked against the skyline, the last of the flowers have withered and the bright colors of fall have disappeared. Some say that winter is the nighttime of the year, a time when the natural world is asleep. While it’s easy to see why people believe this old saying, when I go into my backyard on a winter day and pause for a few moments, what I hear and see tell me that this adage is far from the truth. Read the rest of Terry’s column to learn about enjoying backyard wildlife in winter, including how to turn your yard into a haven for animals in the coldest months. Terry W. Johnson is a former Nongame program manager with the DNR and executive director of TERN, the Nongame Conservation Section’s friends group. His “Out my backdoor” columns are archived here. As a retired professional forester and enthusiastic bobwhite quail hunter, Charley Tarver knows the many values of well-managed southern pine forest. In particular, Tarver has grown to appreciate the longleaf pine system and its importance as habitat for many species of wildlife. His interests and the respect for his knowledge are evidenced by his service on the boards of TERN, The Nature Conservancy in Georgia and The Longleaf Alliance. When Tarver discovered a pair of bald eagles nesting on his Longleaf Plantation in Baker County last year, he was thrilled and enjoyed observing the birds daily. But he still felt like something was missing, so he enquired about the possibility of having red-cockaded woodpeckers introduced to the property. The Nongame Conservation Section proposed that since Tarver’s habitat was excellent and since there were woodpeckers on nearby Ichauway Plantation (Joseph W. Jones Ecological Research Center), staff would create suitable tree cavities at Longleaf and hope to entice a bird or two dispersing from neighboring habitat. During winter, biologist Joe Burnam installed a couple of cavity inserts, a widely used management technique for this species, and nongame staff and Tarver hoped for the best. Last summer, Tarver excitedly reported that a red-cockaded woodpecker had taken up residence on his property! Ichauway biologist Brandon Rutledge determined that the bird was a young male the research center had translocated into its population from Eglin Air Force Base the preceding fall. “Eglin,” as the woodpecker affectionately became known, continued as a lonely bachelor into the fall when Tarver started getting ideas of match-making. During a Longleaf Alliance board tour of Fort Stewart, Tim Beaty, chief of Fish and Wildlife Branch at Fort Stewart and Hunter Army Airfield, met Tarver and learned of Eglin’s plight. Beaty and others at the Army base have built a very successful red-cockaded woodpecker conservation program that has not only increased the population above the installation’s official population recovery goal, but also provided several birds each year for translocation to help other populations grow. Beaty suggested there might be a possibility of moving a Fort Stewart female woodpecker to Longleaf Plantation. As it turned out, approval was secured from Will McDearman, red-cockaded woodpecker recovery coordinator for the U.S. Fish and Wildlife Service, to make the translocation if Fort Stewart had a female available after meeting its other donor obligations. Fort Stewart biologists came through and the selected bird was captured as she went to roost on Dec. 19. At Longleaf, Eglin awoke the next morning probably not thinking that day would be much different from any other. But maybe he was a little curious that three people were lurking in his woods as the eastern sky began to lighten. When he finally emerged from his roost cavity just after sunrise, he might have wondered if he was still dreaming: A beautiful young female woodpecker took form from among the cluster of humans and fluttered to a nearby pine, calling eagerly! Eglin rushed to her side, followed closely by another male that had recently started spending time at Longleaf. The group interacted intensely for several minutes before being left to work out their social arrangements. Recently, Tarver said that the two males are being seen daily, but the translocated female – nicknamed “Stella” – apparently did not take an immediate liking to either of them. However, with springtime just around the corner, he and the biologists are keeping their fingers crossed, hoping that she or another female will decide Longleaf Plantation is home and Charley Tarver will be able to report nesting red-cockaded woodpeckers within a few weeks. Jim Ozier is a program manager with the Nongame Conservation Section. Even if the woodpeckers don’t behave as hoped, the release in southwest Georgia’s Baker County is an example of partnership among those interested in conserving the species. Two U.S. Department of Defense installations with very successful military training programs and exemplary natural resource conservation programs donated endangered birds for translocation to two private landowners committed to managing for the species and its many associates, with the cooperation of federal and state wildlife conservation agencies. Partners working together to meet common objectives is the key to large-scale conservation strategies. 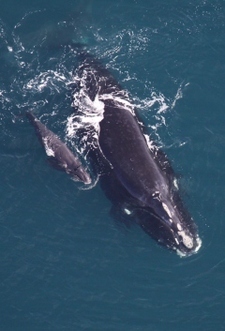 Calving season for North Atlantic right whales is off and, well, swimming, with six mother/calf pairs spotted by aerial survey teams. Thirty other right whales have been seen off the Georgia/Florida coast since December, including 11 females that have calved before and could be pregnant. Sea fog and high winds have limited whale survey flights in recent weeks. Biologists are hoping for better weather -- and more calves -- in the coming weeks. Calving season runs through March 31. Follow the season on Flickr and Twitter. It’s not too late for citizen scientists to help gather data on the timing of wood frog and spotted salamander breeding, information that could determine possible changes in the timing of breeding and contribute to conservation of these amphibians. Learn how to take part in The Orianne Society’s phenology project Snapshots in Time. Georgia’s record number of bottlenose dolphin strandings in 2013 is largely due to the dolphin morbillivirus outbreak. The Georgia Marine Mammal Stranding Network reported 69 dead or dying dolphins for the year, but 37 since mid-November, when the disease deadly to dolphins was documented in the state. Since 2000, strandings have averaged 24 dolphins a year, hitting a previous high of 40 in 2011. Increased public awareness of morbillivirus, which killed dolphins and made headlines along the East Coast, also likely led to more reports of stranded dolphins. The Midwinter Waterfowl Survey in Georgia marked the lowest number of ducks tallied for the annual nationwide survey since 2007, a total about 30 percent below average. According to DNR’s Wildlife Resources Division, an abundance of water – 2013 was one of Georgia’s wettest years on record – likely spread ducks out rather than concentrating them in areas surveyed, contributing to lower counts. The reward for information leading to an arrest or conviction in the shooting deaths of two endangered whooping cranes in Kentucky has reached $15,250. Wildlife agents have asked for the public’s help in finding out who killed the pair of whoopers, mates for life. The Environmental Resources Network, or TERN, friends group of the Nongame Conservation Section, contributed to the reward fund. Eight whooping cranes making their first migration south – 1,100 miles from Wisconsin to Florida – landed at St. Marks National Wildlife Refuge on Jan. 5. Their journey led by ultralight aircraft took three months and included an overnighter in southwest Georgia’s Decatur County. Operation Migration blog. Registration is open for the American Birding Association's young birder summer camps. Both Camp Colorado and Camp Avocet, in Delaware, offer youth ages 13-18 opportunities to sharpen their birding skills, learn about bird life and natural history from experts, explore related careers, and, of course, see unique birds in each area. Camp Avocet video. Scholarships. Youth Birding Competition details will be posted here soon. This year’s DNR bird-a-thon runs from 5 p.m. April 25 to 5 p.m. April 26. Also, deadline for the event's T-shirt Art Contest is March 10! 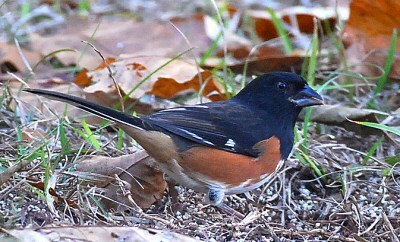 You don't want to miss the Great Backyard Bird Count, set for Feb. 14-17. Participation is easy and fun. Details. State Wildlife Action Plan revisions are in the works, as experts from across Georgia gather to evaluate the conservation status of many wildlife species. Technical teams focused on habitat management, environmental education and other conservation issues are also meeting. The State Wildlife Action Plan, Georgia’s key strategy for conserving wildlife, must be updated every 10 years for the state to receive federal grants critical to conserving nongame species. The rewrite is due by 2015. State Wildlife Grant funding for fiscal year 2014 is 1 percent more than in 2013, ending three straight years of decreased funding that saw the conservation program shrink by a third. The Consolidated Appropriations Act of 2014, which President Obama signed Jan. 17, includes almost $58.7 million for State Wildlife Grants and funds the program – as well as the federal government – through September. The 2014 Farm Bill has also been approved, passing the Senate 68-32 on Feb. 4 and headed to the President, with word that he’ll sign it into law. The five-year legislation is expected to provide more than $1 billion for conserving working farm and ranch lands, a focus that feeds many wildlife conservation programs, according to Land Trust Alliance. Names in the news: The Georgia Chapter of the National Wild Turkey Federation recently honored DNR natural resources technician John Adams of southwest Georgia as Wildlife Manager of the Year. Georgia’s Board of Natural Resources has two new members: Winburn “Brother” Stewart Jr. of Macon, president and chief executive officer of Bibb Distributing Co., and Stone Mountain’s Dwight Evans, a founding partner in Pendleton Consultant Group. Gov. Nathan Deal also recently re-appointed Ray Lambert Jr. of McDonough to the board. A Piedmont prairie restoration project at the State Botanical Garden of Georgia in Athens has been named after veteran worker and teacher Elaine Nash, who had long urged staff to notice the significance of the habitat. DNR biologist Thomas Floyd’s work with hellbenders is included in this recent National Geographic article. Georgia Wild copyright © 2014. DNR Wildlife Resources Division Nongame Conservation Section. All rights reserved.